All roads led to Rathcoole Commercial on Thursday, March 28 for the official opening of its TRP Ireland premises. 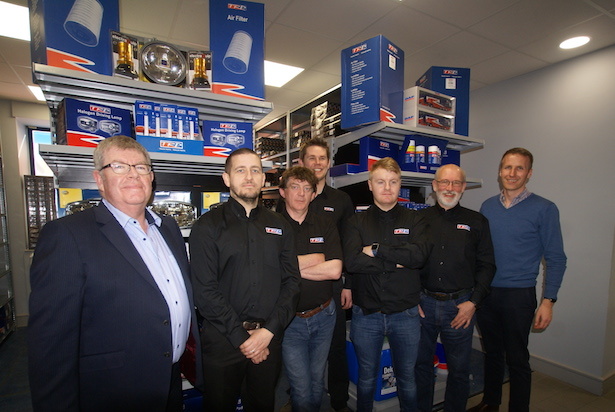 DAF Trucks Ireland Aftersales Director Arthur O’Sullivan, (left) Paul Cooke of Rathcoole Commercial (far right) with the TRP Ireland team at Rathcoole Commercial. Throughout the afternoon and early evening there was a steady flow of visitors to the south Dublin facility. Visitors got a tour of the new facility, met the team and enjoyed the food that was on offer throughout the day. TRP Parts is Ireland’s leading supplier of all makes commercial vehicle parts for truck, trailer, van and bus, with a portfolio of over 75,000 parts, all sourced from major manufacturers. The new Rathcoole store is part of ambitious growth plans for TRP in 2019, and is the second store to have opened in Dublin in the last six months.